Bit bad videoquality :) seems to be to much compression. Nostalgia! Thanx a LOT for it. 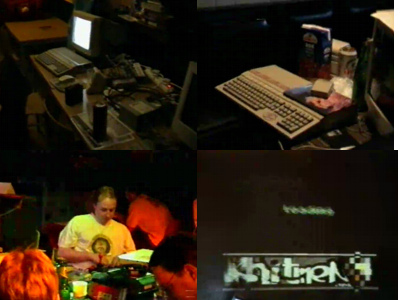 so, judging from the few videos i've seen, how comes that atari parties do generally seem to be this calm? UK'ers will remember 2001 at the height of the foot and mouth season, so the Dutch army confiscated our biscuits when we landed at the Hoek van Holland (but not all of them, as it turned out!) I do remember getting very drunk with a bunch of Poles, (Hi Grey, Sqward!) and the demo compo's had some of the best Falcon '030 demos ever made. There was nothing at all sucky about this party, it rocked! The party was fantastic, but the video is too badly encoded for a thumb. I messed something in my life. It's actually too dark to figure out anything most of the time and the encoding is terribly terribly low quality. There's a hi-res version of the vid at ftp://ftp.untergrund.net/users/felicemaggie/error in line 2.wmv. Please try that one instead. page created in 0.015448 seconds with 15 queries.